Jun. 16, 2016 10:00 a.m.
Ryan Donaldson left a lasting impression, not just on his family, but on his friends as well. But he did more than just leave a mark on their lives; two of his close friends now have a permanent reminder etched onto their bodies. 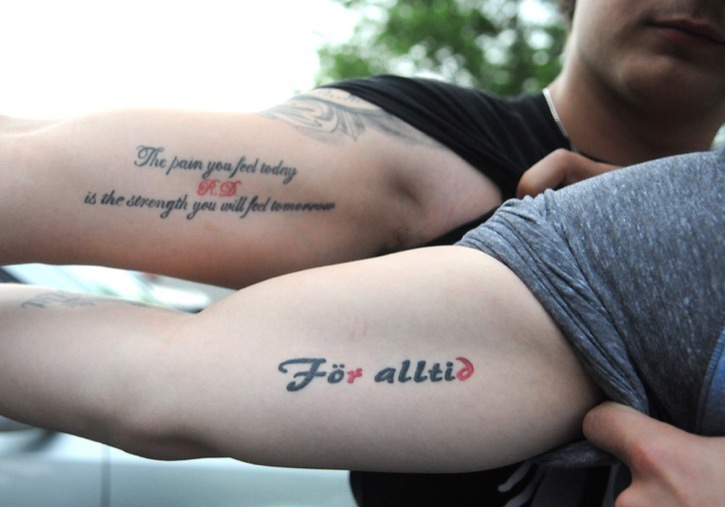 Stefan Virtanen’s tattoo reads ‘For alltid’ which means forever in Swedish, and the last two letters are in red ink, Ryan’s favourite colour. Stefan’s younger brother, Jake, sports a tattoo that says, ‘The pain you feel today is the strength you will feel tomorrow.’ In between the two lines are the initials R.D., again in red ink. “Jake and I had both wanted (our) first tattoos, but we wanted the first one to mean something,” explained Stefan. If Jake Virtanen’s name sounds familiar, it’s likely because he plays in the National Hockey League with the Vancouver Canucks. But he says his good friend Ryan was every bit the hockey player he is, both on the ice and in the inline roller hockey game. Ryan had suited up for Team Canada in roller hockey competitions. Jake called him the Sidney Crosby of roller hockey. The Virtanen brothers were sitting in an empty locker room at the The Hockey House, an indoor roller hockey facility in Langley earlier this month, speaking in advance of a cause close to their hearts, the second annual Ryan Donaldson Memorial Hockey Tournament. It runs this weekend at Langley Sportsplex in honour of their friend, who took his own life in 2014 at the age of 17. The Virtanens are still active in the roller game — Jake uses it as a way to train in the off-season, while Stefan plays at a more competitive level as he prepares to represent Canada next month at an international competition in Hawaii. Jake, who turns 20 in August, met Ryan in Kindergarten when both attended Dorothy Peacock Elementary in Walnut Grove. They were both avid ice and roller hockey players and got along well, quickly becoming good friends. Jake called the relationship a friendly competition where the pair would take turns one-upping each other. “It was a friendly competition, (but) they were the best two kids (on their teams),” offered Stefan, who is 24. “One would score and then the other would go score,” he said. As they played together, the families got to know one another as well. “We were always around the rink together. Just a group of families, always around one another at the ice and roller rinks,” Stefan said. Stefan was one year older than Ryan’s sister, Kirsten, so the two of them became friends. Over the years, they saw each other less frequently, especially after the Virtanens moved from Walnut Grove to Abbotsford before high school. It meant different ice hockey associations, but Jake and Ryan still played roller hockey together out of the Langley Sportsplex. In the 2011 Western Hockey League bantam draft, both boys were selected, with Jake getting drafted by Calgary while Ryan was chosen by Kelowna. Two years later, Jake was a regular in the Hitmen line-up but things had not gone as smoothly for his friend. Ryan had played two games with Kelowna the season before as an underage player and then stayed in the interior to play junior B. But a couple of concussions sidelined him. When both were in town and visited with one another, Jake said he had no idea what Ryan was going though. Stefan said their friend probably didn’t want to let those around him down, as he could always be counted on for a big goal. “He was the guy everyone relied on — he probably felt under pressure,” Stefan said. Ryan took his own life in February 2014, passing away after eight days on life support in hospital. Jake was in town to play against the Vancouver Giants while his friend was in hospital. The day after the suicide attempt, Jake scored a goal and was named third star. Stefan was in the midst of writing midterms at Selkirk College. When he turned his phone on, he saw all the messages and flew home as soon as he could, especially so he could be there for Kirsten. The brothers want others to know that it is OK to ask for the help they need. And they are grateful the Donaldson family has turned their personal tragedy into a way to help others. The recreational hockey tournament this weekend will see 85 players hit the ice. In addition to playing, each participant will undergo baseline testing after their first game. A baseline test measures every area of brain function which could become affected following a concussion. If an athletes does get a concussion, this information is then used to compare their post-injury state to their baseline parameters, to help make a diagnosis and then establish when they are fully healthy and safe to return to their sport. The baseline testing services have been donated by Complete Concussion Management for a second year in a row and will be conducted by Peak Valley Active Health’s Dr. Stefanie Kegler and Dr. Ryan Kegler. The games begin on Saturday at 9 a.m. and will be followed by a skills competition at 4 p.m. The playoff round starts at 9 a.m. on Sunday with the championship at 2 p.m. There is also a burger and beer night on Saturday at Willoughby Hall (8280 208 St.). Tickets are $10 for players and $20 for guests, and that includes a burger and drink. There will also be a cash bar and raffle prizes. Tickets for Saturday night will be sold at the door and players can also still register for the hockey tournament. Diving coach to receive Order of B.C.